You've never heard of Eve, but its first product is made by you. The V, a hybrid doubling as both a laptop and a tablet, was introduced on Indiegogo in 2016. The goal for its crowdfunding campaign was set at $75,000. Eve blew right past that and raised nearly $1.5 million from more than 4,200 backers. And it wasn't just because they liked the design or specifications. Eve took the time to understand what consumers want in a hybrid. Before reading our review, we highly recommend going through Eve's history to get to this point. It's interesting to see exactly how the company was able to collect feedback from a community and actually incorporate it into a product. Most companies say they're listening but don't implement much of anything suggested. Eve, however, had an idea of the device it wanted to create and then made adjustments based on the community's input. Letting a community handle product development sounds like it could be disastrous, yet Eve somehow created a pretty good product on its opening attempt. The V is decent-looking, performs with little-to-no hiccups, and offers lengthy battery life. That's not to say there aren't problems, though. 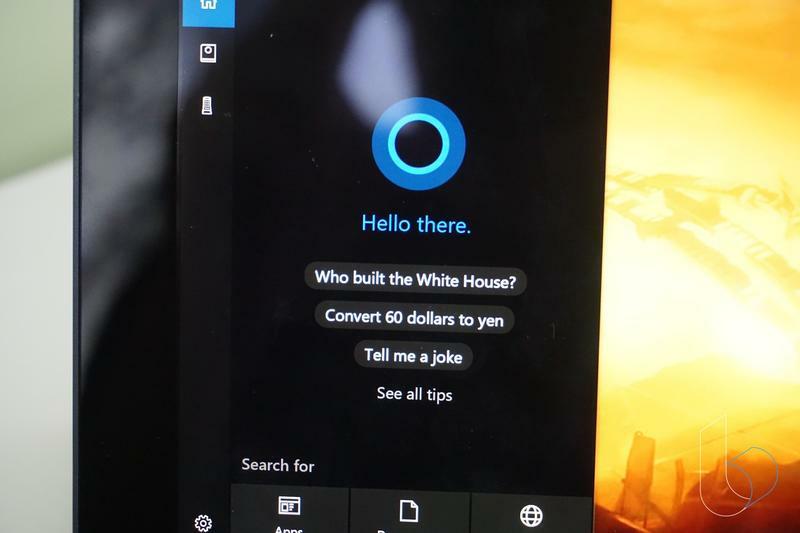 Here's what we think of the Eve V.
Eve's target is Microsoft. 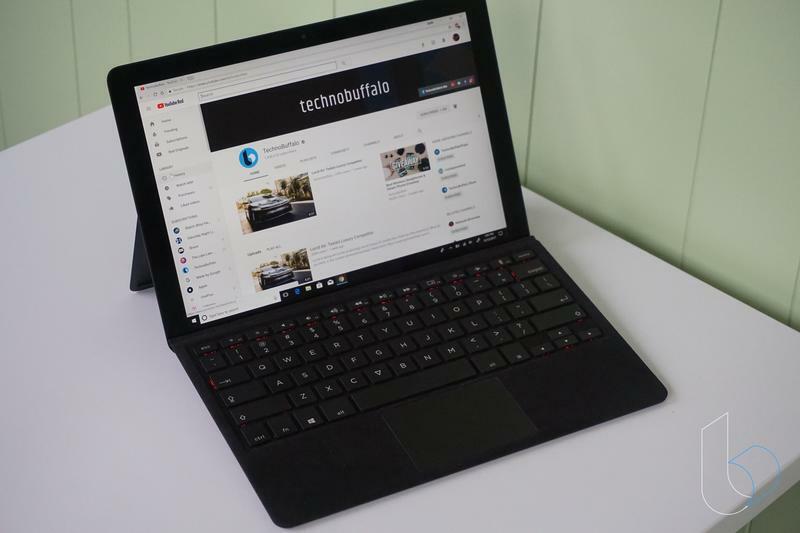 There's no doubt the V is positioned to compete against the Surface Pro, which has been on the market in different variations since late 2012. 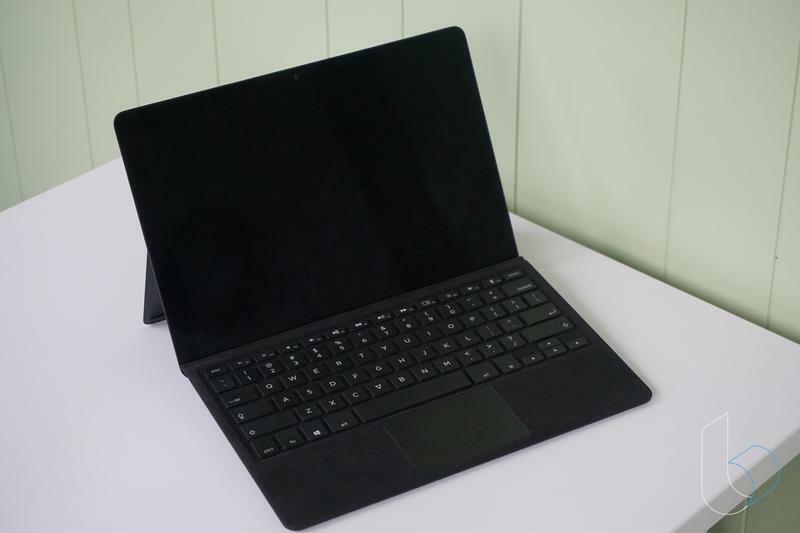 The Surface Pro is really the only hybrid that gets a ton of attention these days, and Eve wants consumers to know there's an alternative waiting for them. Eve doesn't shy away from that, either. Its rival is mentioned several times on the company's website including once in a side-by-side comparison. Is the V ready to topple the Surface Pro? Not quite yet, but this is an excellent start to a potential war between the two. The V doesn't stand out design-wise. 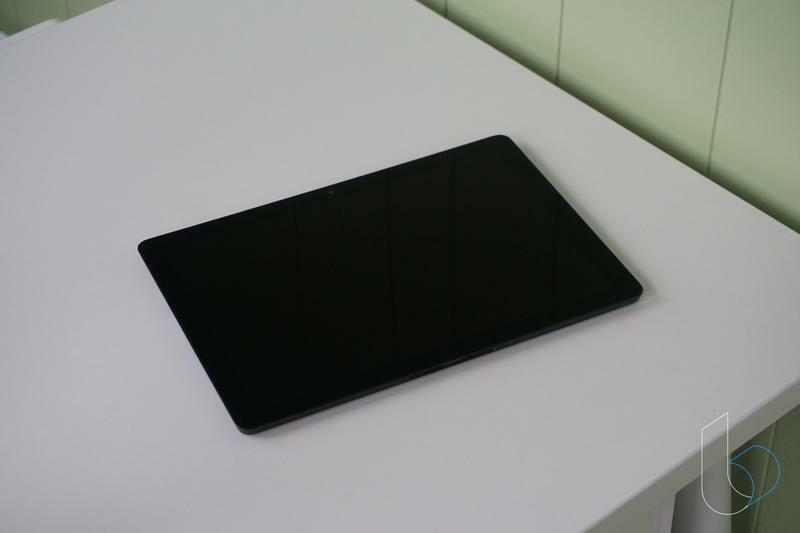 It's a plain-looking device whether being used as a laptop or a tablet. Still, the V is on not-ugly side. Eve creates every unit from a single piece of aluminum. While thin and light, the body remains stronger than the housings used on other devices. Eve also goes through dozens of steps to carve out every line, cutout, and port. The black color is bland, but the silver used by Microsoft isn't what everyone wants. Using a black-colored aluminum gives a neutral look to the premium feel. One area that Microsoft consistently screws up on the Surface line is ports, and Eve's V sure has all of them. Along the left side is 3.5mm audio jack, a USB-C 3.0 port, a USB-C Thunderbolt 3 port, and a USB 3.0 port. Along the right side is a USB 3.0 port positioned below the power button (also a fingerprint scanner) and volume rocker. There's also a microSD card slot hidden behind the kickstand. Don't complain there isn't a DisplayPort or HDMI port. Eve listened to what people really want, and you can mirror your screen using one of the USB-C ports. There should be enough ports on this device to make everyone satisfied. Eve's use of aluminum really shows as the kickstand holds every position firmly. The entire device doesn't wobble if you're tapping on the display. It stays put on any surface. And the angling is terrific. The V can stand however you'd like before stopping at about a 45-degree angle. That makes the V sit perfectly on a flat surface as a laptop or on your lap as a tablet. 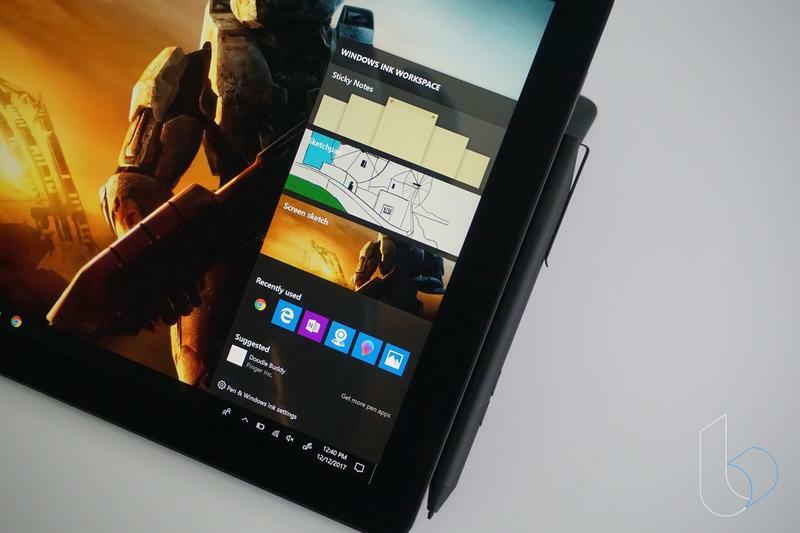 Like the Surface Pro, the V ships with a 12.3-inch display. Eve matches the screen size and aspect ratio (3:2). Then the V pulls ahead in screen resolution, which is 2880×1920 compared to the Surface Pro's 2736×1824. Will anyone spot the difference between them? In all likelihood, probably not. Microsoft's PixelDense technology is excellent, and Eve enlisted Sharp to provide the IZGO display. Eve does go the extra mile by calibrating displays individually to match the sRGB standard. If you're coming from a non-Surface product, you might be surprised by how good the display is. Colors seem very accurate, deep, and vibrant. I didn't notice much of a difference between the V's display and my Surface Book's, which should tell you a lot about the V's value since it's less expensive. As is the case with Microsoft's two-in-one, the V has thick bezels. The mobile industry continues shaving bezels by the month, but the computer industry hasn't moved there en masse. We're still dealing with display surrounded by thick borders. Eve would've scored major points by slimming the V's bezels. Points won't be taken away, though, since most laptops and tablets are just like it. Overall, the V isn't hard to handle. Both the size (11.6 x 8 x .4in) and weight (2lb) are pleasant. 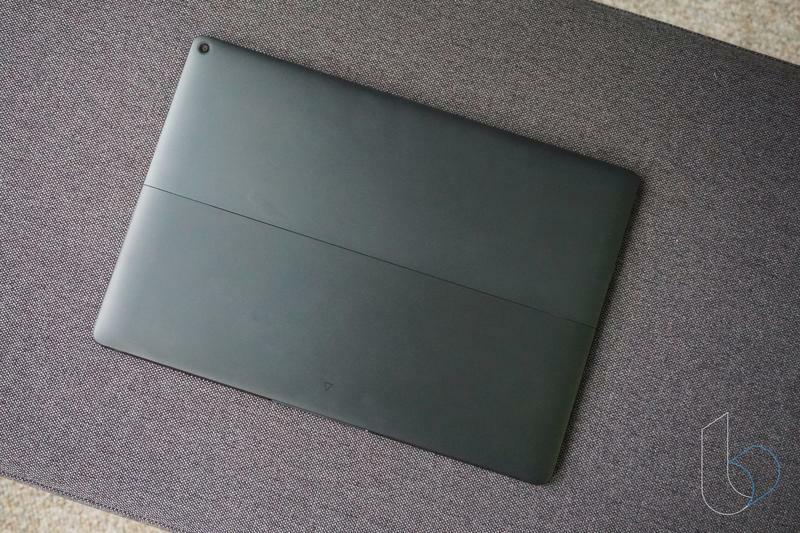 The V is heavier than a tablet like the iPad, but it's also a lot more powerful. And, as a laptop, it's more portable. Eve struck a balance between size and versatility. Its hybrid fit in my laptop bag with plenty of room to spare, and it was light enough to pass around between friends without feeling like a brick. That's exactly what I like about the V. When I'm done doing work away from the office, I can switch to tablet mode for cozy web browsing. The practicality of this is great, too. With my Surface Book, I rarely removed the display unless I planned on drawing something with the Surface Pen. The seamless nature of magnets holding the display and keyboard make me want to use the V in tablet mode. Eve deserves a standing ovation for including the keyboard and stylus at no extra cost. Microsoft, meanwhile, is terrified to bundle essential accessories with the Surface Pro at its own expense. In fact, the Surface Pro actually no longer ships with the Surface Pen. 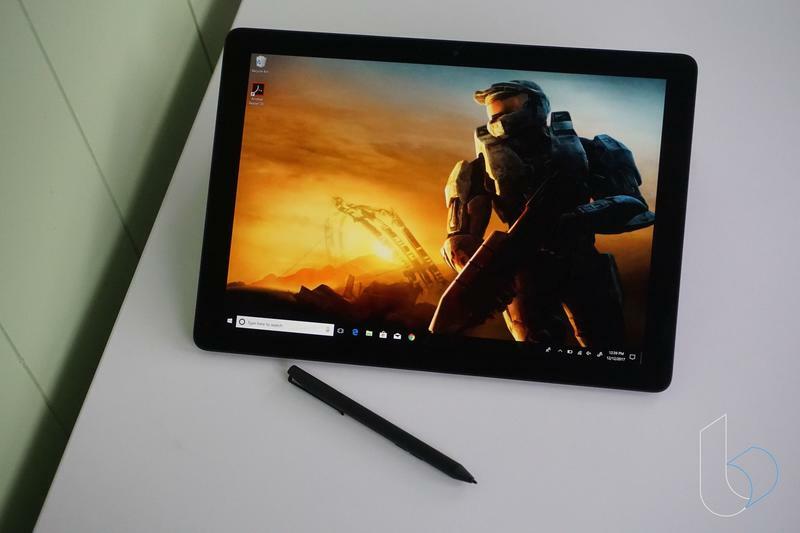 That means, if you want a keyboard and stylus to go with your Microsoft-made hybrid (and you'll certainly need those items), you're going to spend an additional $230. Truth be told that the V's keyboard isn't anything write home about. The fabric around the keys is nice, but it collects dust easily. Also, Eve only offers the keyboard in black. Putting the fabric and color aside, it's still underwhelming. The plastic keys feel cheap, frankly. The vibe I ended up getting replicated the feeling from those off-brand keyboard attachments for the iPad or Fire tablet. Even the trackpad is a disappointment. The glass covering is wonderful, but drag-and-drop activities are insanely challenging. It frustrated me so much to the point where I'd just reach out to the display and manually move windows around the display and files between folders. The keyboard's durability also irked me. In the few weeks I've spent with the V, the plastic keys and glass touchpad are showing stains. These aren't stains from things I've eaten or drank. What I'm referring to comes from common oils in our hands. Normally these stains are collected over lengthy periods of time, not mere weeks. For what it's worth, the keyboard does work over Bluetooth as well. So you can easily position the V in one spot but sit back with the keyboard. And, to personalize the device a smidge, the backlight switches between seven colors. The letters, however, aren't illuminated. Only the outline of every key is, sadly. At least the stylus picks up the slack. Well, almost. It's also made from aluminum, and it has more than 1,000 pressure levels. 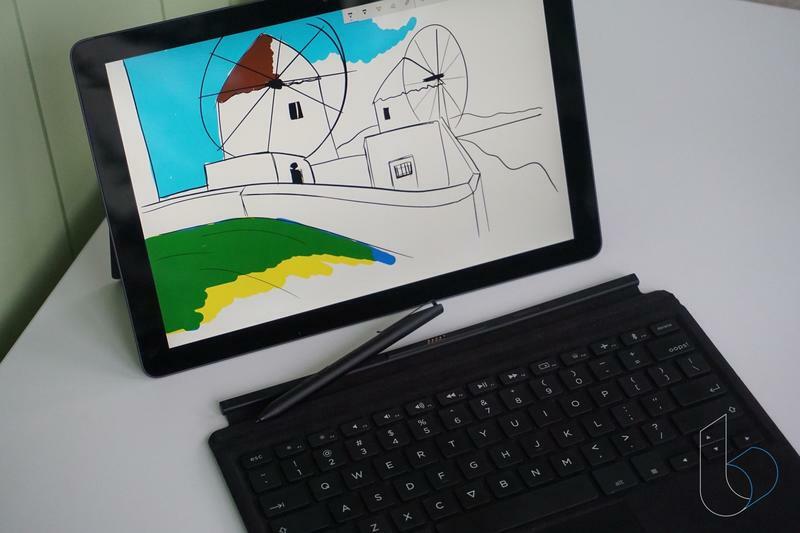 Eve adds that it's compatible with Windows Ink, the software enhancing what a stylus can do on Microsoft's operating system. But Eve's stylus just doesn't achieve Surface Pen-like results. Angles are difficult, and even the number of pressure levels don't seem to be enough. If a good stylus is important to you, Eve does allow the Surface Pen to be used without a hitch. Props to Eve for including accessories, but both the keyboard and the stylus need work. Eve didn't skimp on internal specifications. The V ships with an Intel Core-branded processor, a healthy amount of RAM, and plenty of internal storage. Don't think that knockoff components are being used to keep costs done. The community wanted high-end specs, and that's what they got. 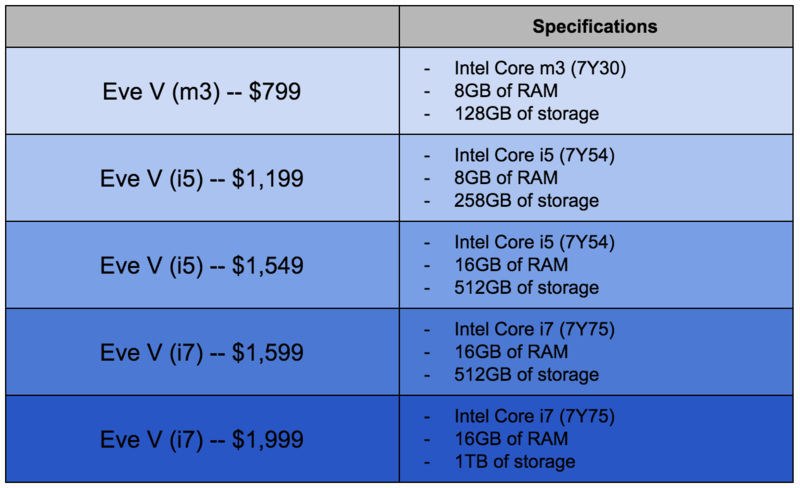 TechnoBuffalo was given the i7, 16GB, 512GB model to test. To put it simply: the V is one hell of a machine from a speed standpoint. It never flinched at anything I sent its way, albeit I don't push my computers to their limits often. The V's performance impressed me because, honestly, I had low expectations from a product that was crowdfunded. There had to be a corner cut somewhere for me to find when the V would choke, I thought. That never happened. The display is above average. The processor is snappy. With that said, the V should be really good for entertainment. 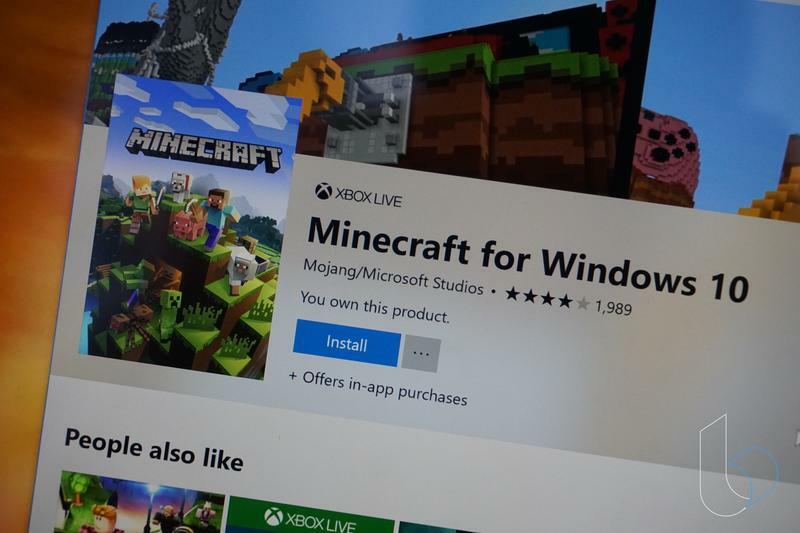 Maybe not gaming because the variety of Intel's processors are focused on efficiency, but titles from the Windows Store like Minecraft are going to play well. And you'll be pleased while streaming video from YouTube or Netflix. As I mentioned, Intel's Y-Series isn't made for power. These processors are built to get you through common activities and preserve battery life. The 48Wh battery, which contributed to the extra thickness for the body, gets you about nine hours on a single charge. Eve's estimate is up to twelve hours, so your mileage may vary based on what you're doing. I was fine with the battery life on my unit because I don't use a laptop for hours on end. 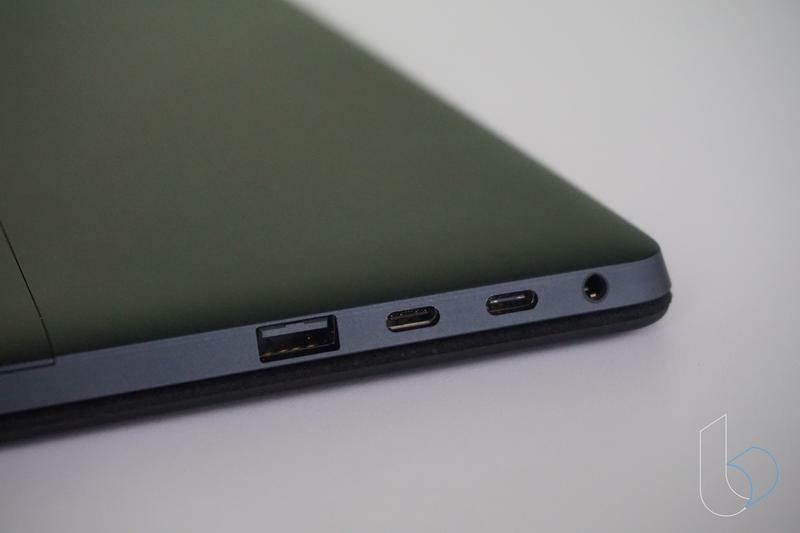 Another place where Eve needs to be praised is the inclusion of a USB-C port. Microsoft finally put one on the Surface Book 2, but the Surface Pro and Surface Laptop are without the port the world is moving toward. Eve includes two of them, allowing you to charge and do something else of your choice simultaneously. Windows is Windows, even on the V. Microsoft handles everything, and Eve doesn't stop them from doing so. Eve didn't have to include any bloatware to drive the cost of its hybrid down. There's literally nothing but Microsoft's collection of apps and services pre-installed. SpectraCal's CalMan for the display's calibration and a device manager for the Thunderbolt port are the only non-Microsoft pieces of software on the V.
The Surface Book was my first major purchase a college student in 2015. I spent a fortune on one of the top models. When I got the V, I figured I'd go all-in on it and not touch the Surface Book. This may surprise you: Eve's V didn't do anything poorly that made me retreat to Microsoft's magnesium-built darling. I enjoyed using the V despite having gripes with the keyboard. Could Eve do better next time? Absolutely, and I'm sure they will. The body will get thinner, the bezels will be slimmer, and the keyboard will be made better. Look at the V from a performance standpoint, and you'll be hard-pressed to find a better hybrid (and perhaps laptop) starting at $799. The stronger models also seem to give more bang for your buck than, say, devices like the Surface Laptop and MacBook. Those, of course, come from companies with solidified reputations. There's no clue as whether or not Eve will exist beyond the V and offer long-term support. You might not be rushing out to buy an Eve V today, but over time this hybrid could make Microsoft worried. Eve's V proves that the Surface Pro isn't the only two-in-one worth your consideration. With equal (or, in some cases, better) specifications at a more affordable price, there's little reason to ignore the V.
If you're interested in the V, keep an eye on Eve's website for a flash sale. Be quick, though, because its flash sales have experienced units selling out in just a few hours.